The instructor will show examples of completed projects using the various techniques used in class. The classes will meet the second Wednesday of the month unless otherwise noted. Please reserve your spot at least 24 hours in advance if you plan to attend so that we can estimate the size of the class and prepare accordingly. 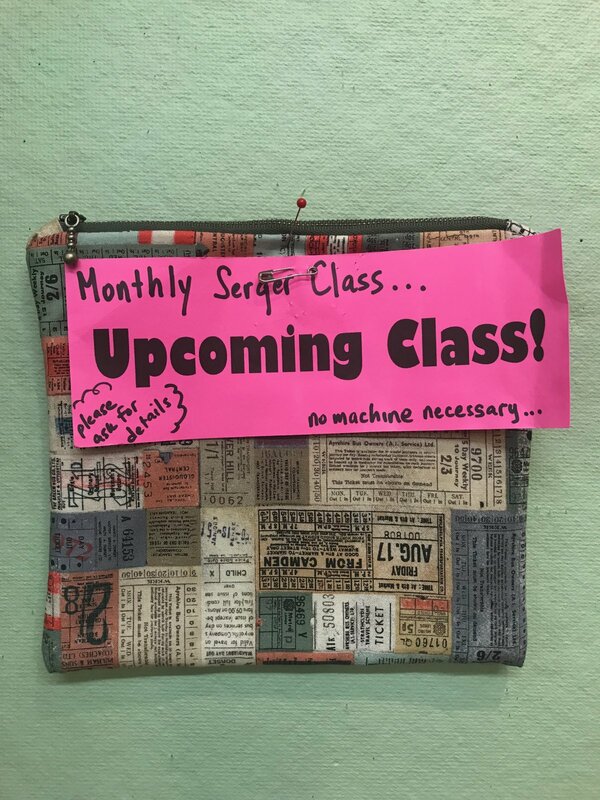 It is our goal for you to have hands-on practice each time so bring your serger, accessories (foot pedal, power cord, screw driver, tweezers, etc) and your manual to class. Materials Included: Class Fee includes the class instructions and may or may not include materials. Please call or come by the shop to determine specific project materials for each months project. Requirements: Please call, or come by the shop, project materials needed each month. Also bring basic sewing supplies including a serger machine (if you would like to sew on one of ours please let us know in advance so that we may move one to the back classroom prior to class), scissors, pins, a seam guage, and thread to match your project.